Artists need to keep on working, and perhaps more importantly, they want to. Ghibli’s actual full-time employees weren’t going to get fired en masse, but if they had the drive to keep on creating then they would need to seek something else. We’re talking about immensely talented people so finding new jobs wasn’t going to be an issue, but of course they weren’t going to accept just about anything; even the affected people who weren’t exclusively tied to Ghibli were, for the most part, theatrical sphere creators. Despite the manufacturing process being essentially the same, there’s a massive difference between working on TV anime and doing so on movies, especially if you’re used to Ghibli’s conditions. And that means that the industry as a whole, still greatly focused on TV series by volume despite recent trends, didn’t really benefit from this development. Though that doesn’t mean there were no exceptions, of course. Look no further than the Ghibli legend Megumi Kagawa: she worked exclusively for the studio since the 80s save for a couple of small lapses, but recently went entirely freelance and did some animation on Little Witch Academia TV #1. Isolated cases aside however, the fact that Ghibli creators have attempted to move towards other anime film productions is clear. Some of Megumi Kagawa’s work on The Wind Rises. Within this changing landscape, Your Name’s timing was impeccable, even if by sheer chance. The first meetings for the project occurred in 2014 and the production itself started in early 2015, making it a succulent target for Ghibli refugees. And those didn’t only come, but made sure to leave their imprint. The movie’s only unit director, thus boasting quite the influence, was the ex-Ghibli Kenji Imura. He joined the studio as a producer and eventually developed a bit of a directional career spawning from that, which led to him handling some of the Ghibli Museum shorts and even acting as assistant director on the likes of Ponyo. After their sort-of-demise he has been more open to working on TV series than most – he was active in Tomino’s G-Reco and recently showed up on Attack on Titan Season 2 – but Your Name was by far his biggest endeavor after becoming freelance. And if he was a notable figure during the film’s production, then Masashi Ando’s presence was simply essential. The Ghibli-bred animator is one of the few artists in the field with enough acclaim to have his name brandished as a promotional asset. He joined them in 1990, as part of a new crop of geniuses alongside Kenichi Yoshida. Ando fully embraced the careful depiction of life that defined the studio, and they reciprocated by trusting him as animation director on historic hits like Princess Mononoke and Spirited Away. It seemingly was his pursue of realism in animation that caused him to confront Hayao Miyazaki and, as that tends to go, he left the studio. Ando then became one of Satoshi Kon’s best allies, even serving as character designer in Paranoia Agent and Paprika. Kon’s death forced him to find new main occupations again (he didn’t have the best of luck in this regard, as his mentor while at Ghibli Yoshifumi Kondo also died prematurely), but the fame he’d earned easily allowed him to find high-profile work. After bouncing around genuine milestones for the Japanese animation industry, something incredible happened – leaving grudges aside, Ando returned to Ghibli. He was one of the main animators in Isao Takahata’s Kaguya-hime, and he animated, supervised and even contributed to the script of When Marnie Was There. Sadly the studio ceased operations right after he returned, forcing him to once again relocate. And there came Your Name. The reason we constantly point out that anime is sustained by an intricate net of acquaintances is embodied by the effect Masashi Ando had here. His mere presence enabled the arrival of dozens of animators who used to work exclusively with Ghibli, as well as artists simply linked to the studio like himself; the aforementioned Megumi Kagawa, Takeshi Inamura, Atsuko Tanaka, Hideki Hamasu, Hiroko Minowa, Shunsuke Hirota, Naoko Kawahara, the list goes on and on. This congregation of skilled people also caused another well-known industry development – if you want a term for it, let’s call it the talent magnet. As long as it’s open to freelancers, any project that accumulates enough high-profile names becomes exponentially more attractive to their similarly skilled peers; directors and animators talk amongst themselves constantly, so industry members are always fairly up-to-date when it comes to succulent opportunities. And so new waves of excellent animators kept on arriving to Your Name. Some of them could still be traced back to Ando – like the master of realistic animation Hiroyuki Okiura – but plenty of them were simply industry celebrities like Norio Matsumoto, Kazuchika Kise, Takashi Hashimoto, Naoki Kobayashi or even Atsushi “goripon” Nishigori. What started with an ex-Ghibli animator joining the project led to a veritable avalanche of talent. This is the true Post-Ghibli Industry effect. Masashi Ando’s layout correction for the famous body swapping sequence. Whether you find these behind the scenes movements interesting or not, they would be mere trivia if they didn’t have a direct effect on the works themselves. Fortunately, Your Name happens to be the culmination of Makoto Shinkai’s recent move towards character expression matching the intensity of the feelings he pours into his films, and it was in no small part thanks to that effect. I suppose it’s a bit of a controversial take to say that Shinkai’s works were poorly animated, since most fans still immediately associate that with how pretty they perceive things to be. Make no mistake though, they definitely were weak. The character animation in particular was incredibly poor, which is quite the issue for someone who made movies all about people’s feelings. His most famous film prior to this, 5 Centimeters per Second, might as well have been starred by pieces of wood. The Garden of Words didn’t fare much better, still lacking any semblance of acting. And if you go back enough with movies like Place Promised in Our Early Days, the situation is an outright disaster. Shinkai’s work had for the longest time been at its most eloquent when not focusing on its characters, but that obviously wasn’t by design; his excellent environmental expression stems from the fact that he’s a one-man army creator that always heavily leaned towards background art and photography, but those propensities are also the root of his issues with animation. Without an ally on that front, his craft was fundamentally flawed. And that’s where Masayoshi Tanaka enters the picture. His first collaboration with Shinkai – the delightful commercial Crossroad – quite literally brought life to his characters. As a director he obviously didn’t need to get rid of his striking illustration-like worlds, but to actually populate them. And Tanaka’s characters are nothing if not alive; his previous theatrical project Anthem of the Heart revolved around a girl who couldn’t normally express her emotions, so the staff needed her to genuinely act to make the character work – its success with this tricky challenge speaks volumes of Tanaka’s aptitude. On Your Name he acted as the main designer with the support of Masashi Ando, and their output enabled some spectacular work. The film’s careful body language when dealing with the swapping, the playful yet restrained deformations, the realistic body motion when needed and everything else the film had to offer are all resources Shinkai never had at his disposal, and that I will love to explore at a later date. While on a much smaller scale, some solid animators had worked on his films before. But without malleable designs and the willingness of a supervisor to make them act, it all fell flat. Tanaka and Ando provided that, then the very capable crew did their part to elevate the film. It’s not that much of a surprise that this movie has connected with many more people than his previous works when the whole cast is, on a fundamental craft level, much easier to empathize with. These are partnerships Shinkai should definitely want to maintain. 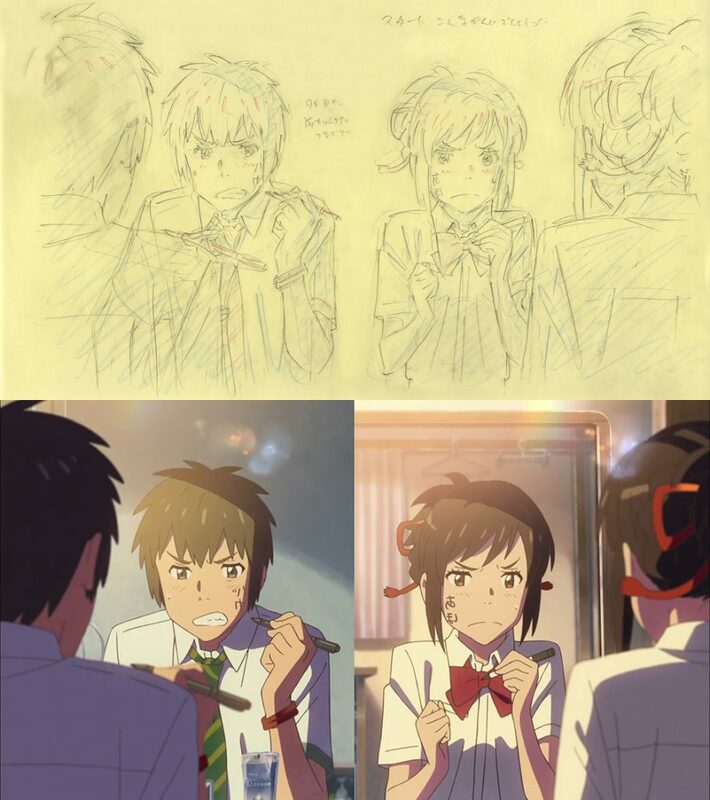 Masashi Ando’s reference sheets for Mitsuha doing her hair. 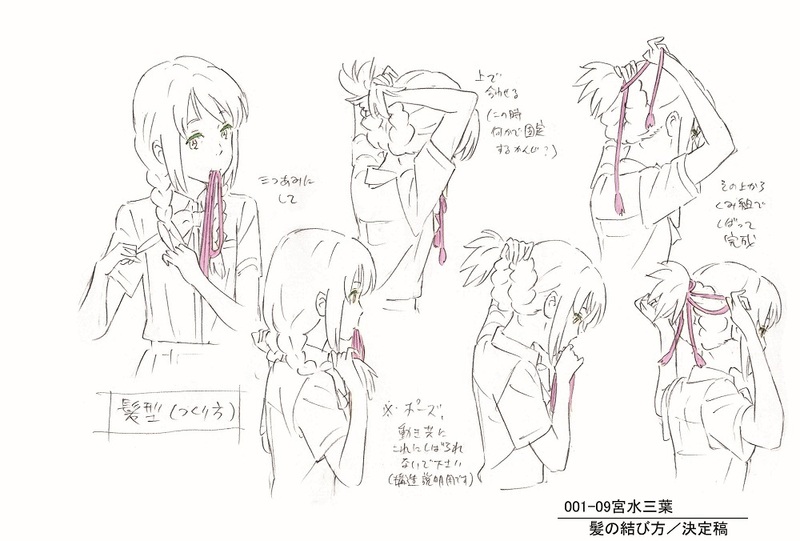 A deliberately complex process to contrast with Taki only being able to tie a crude ponytail, and another subtle way to introduce the thread motifs. As excellent of a concrete example as Your Name has been though, there obviously is more to this Post-Ghibli climate. Mamoru Hosoda and his studio Chizu are always an important factor, since he’s collaborated with those artists in the past and the chances for that will increase tenfold for his next film Mirai. And it would be beyond careless to neglect the company’s most natural successor: Studio Ponoc, founded by ex-Ghibli producer Yoshiaki Nishimura alongside Hiromasa Yonebayashi and a few more creators with past at the studio. Their very name is an allusion to this, as the term – literally midnight in serbo-croat – signifies the start of a new day; it’s as much of a beginning as an acknowledgement of what came before, fitting a new studio that has clearly inherited Ghibli’s aesthetic sensibilities and even their modus operandi. 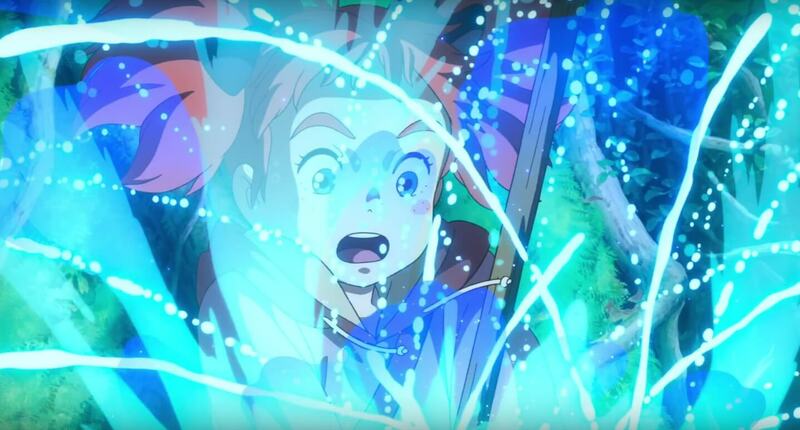 Their first feature film Mary and the Witch’s Flower is based on Mary Stewart’s children’s novel The Little Broomstick after all, which immediately brings to mind the kind of source material that Ghibli sought. While the movie has yet to premiere, it’s obvious that artists who used to be affiliated to the studio have been working on it – even those whose links was very tenuous, since the latest promotional videos seem to feature the work of Shinya Ohira. This should come as no surprise, but Neo-Ghibli will also attract many creators who used to work with them and want to return to a similar space. And if we’re talking about studios capable of attracting Ghibli creators, how about…well, Ghibli itself. Just yesterday they started recruiting new people for Hayao Miyazaki’s last-but-for-real-feature-film after all; they are specifically targeting youngsters to join as in-betweeners and background artists, though showing no willingness to adapt to the new realities of anime production. Don’t even think about joining if you’re a digital animator! It’s likely then that the film will end up being carried by the old guard in the end, especially if they consider it their last chance to bid farewell to Miyazaki. 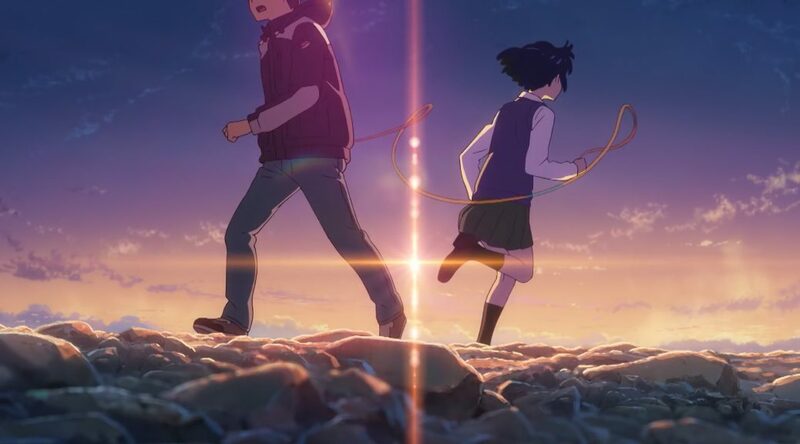 Returning home even if simply for a last time, moving to a studio that is similar to where they used to work, or embarking in exciting freelance ventures like Your Name – the truth is that there are many possibilities for the creators who used to work at arguably the most important anime production company. The loss of the studio was a painful one for this industry, but the Post-Ghibli panorama is undoubtedly exciting. It hasn’t caused the sudden influx of talent for the industry as a whole that some people dreamed about, but its positive effect on the theatrical space is now a reality rather than optimistic speculation. Even if you’re in the minority and weren’t enthused by Your Name, you can at least consider its existence positive proof of that. “Ando fully embraced the careful depiction of life that defined the studio, and they reciprocated by trusting him as animation director on historic hits like Princess Monoke and Spirited Away.” There’s a typo there. Other than that, this was an interesting read! Thanks for reporting on this. Thanks for the heads up. I don’t know how I didn’t catch it because Monoke sounds so WRONG. After the SAO movie’s dreadfully boring character animation outside of fights, your name. was a breath of fresh air. I’m glad the talent went there. Also that guy in that Wind Rises cut looks like Basara from Macross 7. Dang, that’s fascinating. It’d be nice if there ended up being more of a mixture – the SAO film really suffered trying to sell camaraderie between the characters because the character acting was so wooden (and the script was lame and the storyboards boring, but that’s another story). These two sentences were probably intended to be one? Certainly sounds wrong. I really hope for the best for Ponoc. I LOVE Yonebayashi and can’t wait to see his new project. I also think the PV is drop dead gorgeous. Man, I’m so psyched for that. Also related, I don’t know if this is really all that likely, but as per your tweets the other day, it would be really interesting to see KyoAni move entirely toward theatrical releases in a similar way to Ghibli or Chizu. I personally wouldn’t hate that, because man, it would be an incredible treat to have things like A Silent Voice and Tamako Love Story come out of there regularly, but I would also certainly miss their brilliant TV series occupying that space that no one else seems to be able to.